The Atkins diet | What is Atkins? | Can Atkins help you lose weight? The Atkins Diet was initially aimed at individuals with obesity. The main focus is on reducing the amount of carbohydrates and at the same time increasing the amount of fat. Atkins consist of four stages. Very small amounts of carbohydrates are allowed (20 g) in the first stage which is termed induction. This usually leads to rapid weight loss. In the next steps, carbohydrates are added in specific increments until you find the level of carbohydrate consumption at which you can continue to loose weight gradually. You stay at that level of carbohydrate consumption until you are within a few pounds of your goal, then you can move into the last phase which is considered to be a lifetime maintenance plan. The Atkins diet was first introduced in 1972 when Dr. Robert Atkins published his first book, “Dr. Atkins Diet Revolution”. Robert Atkins was an American physician and cardiologist born in Columbus, Ohio in 1930. Atkins was very interested in nutrition and lifestyle measures to fight obesity. His initial methods were based on the research of another US scientist, Dr. Edgar S Gordon from Madison, Wisconsin. On October 5, 1963, Gordon and coworkers published an article in JAMA (Journal of the American Medical Association) called “A New Concept in the Treatment of Obesity”. Atkins became interested in their methods and tried them on himself with good results. Although his book, “Dr. Atkins Diet Revolution, sold millions of copies his methods were strongly criticized by many colleagues and nutrition experts, some actually thought him quite mad. His methods severely contradicted mainstream nutritional recommendations. Increased consumption of fat was thought to be not only undesirable but dangerous. Dr. Atkins book, “Dr. Atkins Diet Revolution” was published in 1972. Since then, Atkins theories have been criticized bay many nutrition experts. However, forty years later, his theories are respected and accepted by many specialists who consider them an important tool in the fight against obesityAtkins was the first to emphasize the importance of insulin in individuals with obesity. Insulin is known to be important for the control of blood sugar, and most individuals with diabetes are acquainted with the role of insulin. Recent scientific research has illustrated the importance of insulin for cardiovascular disease, high blood pressure, and aging. Atkins explained that insulin causes the body to store fat, that some people are metabolically primed to put out more insulin than others in response to the same foods, that sugar and carbohydrates were the prime offenders when it came to raising insulin and that elevated levels of this hormone invariably resulted in increased body fat. He argued that it is not fat in the diet per se that makes you fat, but rather sugar; more precisely, fat in combination with sugar. Atkins took serious issue with the idea that fat causes heart disease and claimed that his diet would actually improve blood lipid profile measurements, thus affecting this particular risk factor for heart disease in a positive way. Atkins spoke in positive terms about a condition called “ketosis” and considered it a metabolic advantage. When carbohydrates are not consumed, glucose is released from glycogen stores, primarily in the liver. However, glycogen stores are limited, and the body has to start using fatty acids for fuel, thus burning fat. Ketones are byproducts from the breakdown of fatty acids. Fatty acids are however not available for the brain and central nervous system which is why these tissues have to use ketones for fuel. For Atkins, being in ketosis was the secret to unlocking your fat stores and burning fat for fuel. Ketosis was the desired goal of the induction phase. Being in ketosis was the proof that you were throwing the fat stores in the metabolic oven, using your fat, instead of sugar, for energy. The problem was that mainstream medicine considered ketosis to be highly undesirable and that it should be avoided at all times. Atkins explained that low carbohydrate consumption would diminish the body fat stores in two different ways. Eating less carbohydrates and sugar brings down your level of insulin. Less insulin means less fat storage. Secondly, shortness of carbohydrates forces the body to use fatty acids as fuel to produce ketones which are necessary for the brain. Dietary fat has no effect on insulin. Atkins, therefore, reasoned that, even if there s a lot of fat coming into the diet, there is not enough insulin to drive the fat-storing machinery. He suggested, that even if there is a lot of fat coming in, you will not gain weight as long as carbohydrates are kept to a minimum. First stage (induction). This stage should last for two weeks. The Atkins diet is quite simple. You do not count calories. You do not count protein. You do not count fat. You can eat all the fat you desire, but trans fats should be avoided. You do have to count carbohydrates, and they are very limited in the first stage, you can have up to 20 grams a day preferably in the form of salads or uncooked vegetables. Starch, grains, sugar, fruit, and alcohol is prohibited. Coffee was initially not allowed because it could stimulate cravings. In a new version of the Atkins Diet, “The new Atkins” coffee is allowed because it me stimulate fat burning. Weight loss is usually quick and may be quite dramatic in the first stage. The weight loss is due in large part to a loss of water and bloat because insulin’s message to the kidneys to store salt is reduced. Atkins suggested that you relatively soon move to the second phase although you may stay in the first stage for up to four weeks. The second stage is called “ongoing weight loss” (OWL). In this stage, you have to define what is called “Critical Carbohydrate Level for Losing” (CCLL). This is done by slowly adding back carbohydrates at a rate of 5 grams per week which allows you to eat 25 grams a day for the first week of the second stage. If you continue to loose weight, you go up to 30 grams a day for a week. This is continued until weight loss stalls, and then you cut back to the previous level. That level is defined as CCL. When you are 5 to 10 pounds from your goal you move to the third phase (premaintenance). In this phase, you increase your carbs by another 10 per day for a week. Again you are looking for the level of carbohydrate consumption that will let you keep losing, although at a much slower rate than before. Atkins thought it was important at this stage to slow the weight loss down to less than a pound a week for 2 to 3 months. At this stage, you are adapting to a new long-term lifestyle and preparing for the fourth step (Lifetime maintenance) where you will eat the amount of carbs that lets you stay at the weight achieved. How much carbohydrates people can eat at this stage varies very much but is usually between 25-90 gram a day, sometimes more among those who exercise much. For the last 40 years, the Atkins concept has met severe criticism by the medical community. These concepts have challenged mainstream medicine and evoked many negative responses by physicians and other experts in the field of diet and nutrition. 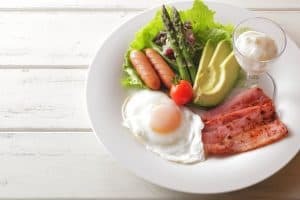 Much of the criticism, however, has been aimed at the first stage of the Atkins diet, which may not be fair as this stage usually only lasts for two weeks. This stage is characterized by almost no carbohydrates but relatively high amounts of protein and fat. Many experts consider this to be undesirable if not dangerous. In this stage, you are not allowed to eat rice, potatoes, cereals, starch, pasta, bread, fruit or milk products other than cream or cheese. However, during the later stages carbohydrates are increased, and the diet is modified according to individual needs. Does saturated fat increase the risk for heart disease? In March 2010 the American Journal of Clinical Nutrition published an article called “Metaanalysis of Prospective Cohort Studies Evaluating Association of Saturated Fat with Cardiovascular Disease”. This scientific paper indicates that there is no association between the consumption of saturated fat and cardiovascular disease. Mainstream recommendation on diet and nutrition have for many years emphasized that a healthy diet should include 50-60% of carbohydrates, 25-35% fat and 10-20% protein. The highly respected Physicians Committee for Responsible Medicine has warned against some parts of the Atkins Diet and indicated that the amount of protein is too high and that the diet supports the consumption of too much cholesterol and saturated fats. It is interesting that despite all the strong critics the Atkins diet has survived the test of time and is now accepted by many experts. Many scientific studies have indicated that low carbohydrate diets may indeed be very effective to treat obesity. Many respected universities and medical clinics, like the Mayo Clinic, consider low carbohydrate diets to be important tools to fight obesity. Research indicates that low-carbohydrate diets may improve diabetic control, increase HDL cholesterol (the “good cholesterol) and lower the concentration of triglycerides in the blood which is considered positive. Dietary guidelines and recommendations in the US and most European countries have for many years recommended diets with a high amount of carbohydrates, and low amount of fat, mostly warning against cholesterol and saturated fats. Some critics of these recommendations consider them to be the main cause of the huge obesity epidemic in western countries. The Atkins concept has gained support from many physicians and other experts during recent years. The concept that saturated fats are dangerous has been heavily challenged by many and experts who have pointed out the lack of scientific evidence behind this statement. In 2010 The American Journal of Clinical Nutrition published a meta-analysis of studies addressing the association between saturated fats and the risk of cardiovascular disease. This analysis indicates that there does not appear to be any link between the consumption of saturated fats and the risk of cardiovascular disease. Your statement that there is no link is not exactly what the authors have to say. Thank you for the comment Kate. The authors mention a few limitations to their study, as you point out. However the results of their metaanalysis and their own interpretation of it is very clear: “Intake of saturated fat was not associated with an increased risk of coronary heart disease, stroke, or cardiovascular risk”. I have a keen interest in understanding the health benefits and disadvantages of a low carb diet. I feel best when eating close to zero carbs, as in the induction phase of Atkins. So, I try to stay on this regimen for the long term. Are there any known health issues of doing so? I have been recently reading about how mTOR is associated with again and how starvation diets increase lifespan in mamls because it interferes with mTOR. There are more recent studies that implicate carbohydrate consumption and insulin, so a low carb diet may actually be associated with increased lifespan. Any insights into this? Final question, why are vegetarians supposedly so healthy if carbs are bad? I was on a Low Card diet for over a decade with good results. You can see my data at https://unknownphysicist.blogspot.com/2011/10/eating-lots-of-fat-to-lose-weight.html. I enjoy level-headed discourse on this topic and look forward to learn more from your blog. BTW I enjoyed your most recent post on low carb diets with a list of what is known about their affect along with references. You very succinctly state in a few lines what Taub discusses in his book “Good Calories Bad Calories” Any comments on this book? Thanks for your post Mark. As you probably know there have been some health concerns regarding the long term effects of very low carb diets (VLCARB). Some have been related to the negatives of high protein consumption and other to the negatives of high consumption of saturated fat. These are the main reasons why the American Heart Association, for example has never supported VLCARB for weight loss. Some of the concerns have also been related to the nutrients you miss when you limit your consumption of grains and fruits. Some have also suggested that the diuretic effect of VLCARB may cause electrolyte disturbances. Osteopenia, kidney stones and cardiac problems have also been associated with long-term VLCARB. I don´t have enough knowledge or experience to tell you whether these concerns are relevant or not. However, I have met individuals that seem to feel good on long-term VLCARB, jsut as you do. But I think you will definitively have to think about the nutritional aspect; vitamins and minerals. Regarding the question about the vegetarians I must tell you that I don´t generally think that carbs are bad. However, I believe that some people are intolerant to them, in particular individuals with obesity, overweight or the metabolic syndrome. Therefore I believe these individuals may often experience weight loss and health benefits from low carb. Thanks for your interest in my blog. Hope you visit often. The Atkins diet is really helpful for weight loss? I need to be ensure. Because I’m facing so much problem for my heavy weight,need to reduce this. I just started Atkins. People kind of frown at me when they find out, but here’s the facts. I am OBESE. I have at least 80-100 pounds of weight to lose. I have tried every diet and yes, I had lost weight. Here’s the difference I see with the Atkins: The less Carbs I eat, the LESS food I want. I can not explain it any better. I want to lose weight, I have to lose weight. I have already had a hip replacement and a knee replacement. Osteoarthritis is eating me alive. People tell me that a high fat diet will kill me, well guess what, so will being OVERWEIGHT. I am depressed that I am exhausted going up a flight of stairs…I am depressed that I can not wear the cute clothes slimmer women wear…I am depressed that when I sit down, my lower abdomen nestles on my lap. Enough is enough. I don’t have to be skinny….I just want to feel good in my own body. I don’t know if this is the right way of life for someone who wants to lose say 10 or 20 pounds, I don’t know, but if you are obese….this is the diet for you, at least it is for me. Loved eating all the mash potatoes, chips, donuts, and all those “comfort foods” we grab when were down or bored, but I have found out…with Atkins, there ARE choices. Yes, I do believe the world ISN’T Atkins friendly, but if you want something bad enough, you must work at it. Right now, I am content and guess what…the other day, I forgot to eat….imagine that? Best of luck Lanie. Hope your health and quality of life will improve along with the weight loss. I am a low carber myself. I’ve lost over 40 pounds over the years (6 years to be exact) and now I don’t even like to eat sugar. Low-Carbing has become a lifestyle change for me. And as Lanie says in the post above – you don’t have to be skinny, you have to feel good in your own body. And there are so many health benefits.